The Phoenix Theatre Company’s Mainstage Theatre, Hormel Theatre, and Judith Hardes Theatre, are located in central Phoenix just north of downtown on the northeast corner of McDowell Road and Central Avenue in a shared complex with Phoenix Art Museum*. Playhouse on the Park, our sister venue, is located at the intersection of Central Avenue and Palm Lane. If traveling to our theatres via the I-10 freeway, take the 7th Street exit and go north to McDowell Rd. Take a left onto McDowell. Continue on McDowell for approximately ½ mile to Central Avenue. Go north on Central and take a right at the first stoplight. If using the Light Rail, please exit at the Central/McDowell stop and head north on Central Avenue. You will turn right off of Central Avenue into our shared parking lot with Phoenix Art Museum. 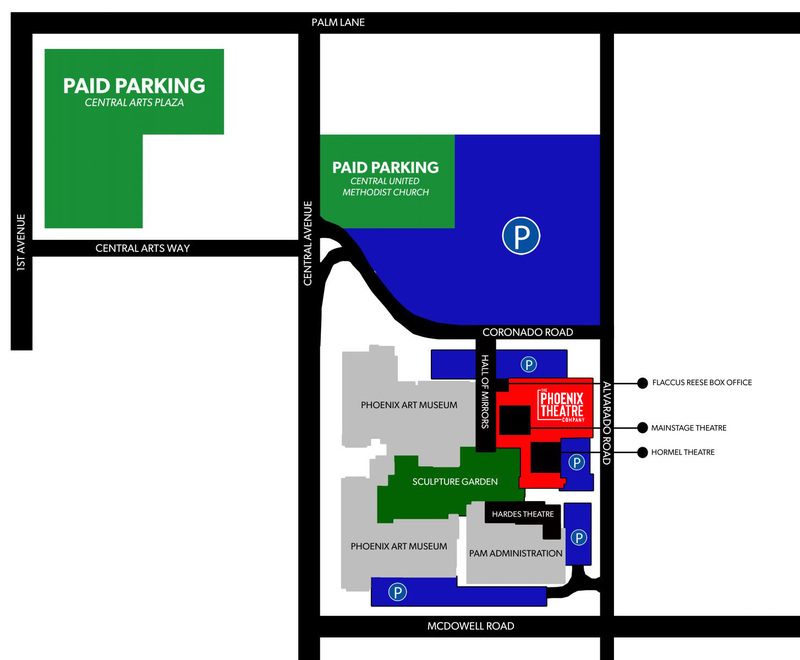 Free parking is available in the several surface lots adjacent to our complex. As The Phoenix Theatre Company shares a parking lot with Phoenix Art Museum, please note that some performances take place at the same time as a Phoenix Art Museum event, and parking may be difficult close to showtime. April 4, 5, 6 (matinee and evening), 10, 13 (evening only), 16, 17, and 20 (evening only). Playhouse on the Park is located at the Central Arts Plaza across Central Avenue from The Phoenix Theatre Company, at the corner of Central and Palm Lane just north of McDowell Road. The entrance to the parking lot is off of Palm Lane. The address is 1850 North Central Avenue, Phoenix, AZ 85004. Free parking is available in the surface lot adjacent to the theatre. To access the lot, turn west on Palm Lane and south into the lot.